Have you heard the words root canal from your dentist? If so, don’t freak out! Root canals have a bad reputation for being painful and a waste of time, but this isn’t the truth. 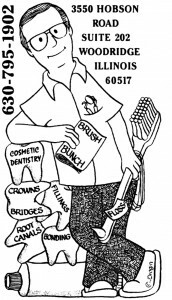 Root canal treatment in Woodridge is one of our top procedures. If you have significant pain in your tooth, it might be a sign that you need a root canal. Before you decide to go with an extraction, read about the top 4 benefits of root canal treatment in Woodridge from your dentist here at Machnowski, DDS. You might have heard that root canals are a waste of time and you should just get an extraction instead. This is not the best idea. When you receive a root canal the infected pulp is removed and then filled with composite material. It’s then capped off with a dental crown to protect your tooth from any further damage. Although your tooth dies when you receive a root canal, this doesn’t mean it will fall out. The bone mass in your jaw holds the root in place. In other words, your tooth is now serving your dental crown as a dental implant would. By not having your tooth extracted, you’re saving yourself from needing a dental implant or other tooth replacement. If you don’t know, dental implants are expensive. Save yourself from the cost and opt for a root canal. When it comes time to receive a root canal, you’ll know. This is because, before your root canal treatment, your mouth will be in severe pain. Root canals are needed when the nerves become infected. This can make eating, drinking or even breathing a painful process. Thankfully, root canal treatment is a pain-free experience. Our dentist makes sure you are pain-free through the entire procedure by using anesthetics to numb your mouth. Once your mouth has healed, you won’t feel any more tooth pain! You might wonder what your tooth will look like following your root canal. Don’t worry about this. One of the top benefits of root canal treatment is how great your tooth looks afterward. Our dentist places a tooth-colored dental crown on top of your tooth after the procedure. The results will look completely natural. If you want a quick and affordable fix, root canals are the solution. Of the benefits of root canal treatment, this is one of the highlights. Your root canal treatment will not only be less expensive than an extraction and restoration, but the results are felt sooner. You don’t have to wait for your mouth to heal after an extraction to opt for a replacement tooth. There is no downtime when you receive a root canal. Your tooth is fixed and restored in the same day! If you’re ready to fix your hurt tooth with a root canal, give Machnowski, DDS a call today or fill out our online form to schedule your root canal treatment.